This piece is a conclusion of the series on myocardial markers, which has become a Gold Standard over the last 15 years, beginning with the introduction of the standard assays, and then migrating to the high sensitivity version, mainly because of the concern that acute myocardial infarction can be broken into a Type 1 and Type 2 infarct, which would have prognostic as well as therapeutic significance. This hypothesis was presented in an earlier article. There is still much to be done, and some of the germaine work will be presented separately. Copyright: (c) 2007-2014, PathologyOutlines.com, Inc.
clinical routine, also markers of the renal function have gained increasing interest. been shown to be useful for selection of specific treatments. Of the 939 patients enrolled in the study, 205 (21.8%) had myocardial infarction. for the diagnosis of non–ST-segment myocardial infarction. who presented four to six hours after symptom onset. non fatal myocardial infarction (HR 4.0, 95% CI 2.4–6.7). KM. Eggers, AS. Jaffe, B Svennblad, and B Lindahl. Crit Pathw Cardiol. 2012 Dec;11(4):199-205.
low or intermediate chances of having MI when cTnI was negative at 2 hours. in whom early discharge or admittance for further evaluation would be appropriate. hs-TnT and standard cTnT for AMI diagnosis did not differ significantly. 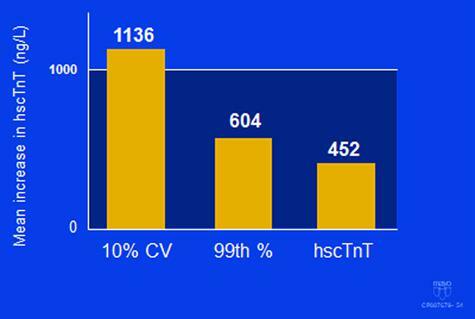 hs-cTnT detected significantly more cardiac diseases. ED readmissions and mortality from all causes. M Weber, A Luchner, S Manfred, C Mueller, C Liebetrau, et al. with elevated NT-proBNP 4.8 vs. 1.4% (P ¼ 0.002). hsTnT as a predictor for mortality of 0.809.
the combined endpoint [HR 2.6 (95% CI: 1.3–5.3); P = 0.01]. RJ. Aviles, AT. Askari , B Lindahl, L Wallentin, et al. N Engl J Med 2002; 346:2047-52.
syndromes regardless of their level of creatinine clearance. Vascular Health and Risk Management 2014:10 435–450. and a specificity of 0.41 (95% CI: 0.40–0.42). higher diagnostic accuracy (relative diagnostic OR = 2.13, P=0.02).